Every one of us is guaranteed to experience the unexpected. But when the unpredictable shakes our faith, we hide behind our defenses, trade our hope for fear, and end up living a smaller version of the grand story God wrote for us. Is it possible to not only expect the unexpected, but even embrace it? Unexpected offers encouragement and practical steps to move from anxiety about the unpredictable to confident faith in a good God. Through compelling stories and practical strategies, this book will help you anticipate the unexpected and to live in the joyful freedom of complete trust in God. "When unexpected circumstances shake us to the core, it's only natural to feel afraid and uncertain. But what if we could learn to trade our fear for the certainty that God’s plans are good? That’s why I’m so thankful my friend Christine wrote this perspective-changing message. I love the calm reassurances and Biblical truth Unexpected speaks to my soul." “I love the profound truths within the pages of this book. Chris shares how God can move in the unexpected moments of life in such a way that leaves you encouraged, loved and full of faith. Everyone needs to read this!" “I affectionately refer to my dear friend Christine as the “Hurry-Caine” – she’s quick and unpredictable. In Unexpected she shows us that while uncertainty may be in our future, fear doesn’t have to be our forecast." "When I first heard Christine Caine preach, she did so sitting on a motorbike in the middle of the stage. It was unexpected! Her talk was utterly brilliant. 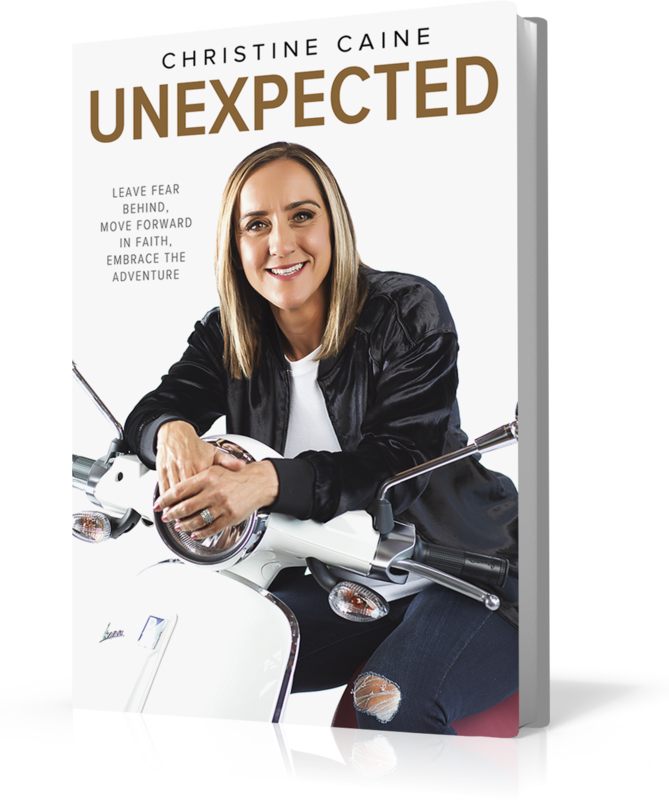 ‘Unexpected’ is Christine Caine at her very best, written often with great vulnerability. It is Biblically based, beautifully illustrated and hugely relevant to all our lives. Highly recommended!" "Christine doesn’t simply write about conquering the fear of unexpected heartbreak and hardship, she’s a doggone gospel gladiator waving the sword of truth as she charges into scary territory!"